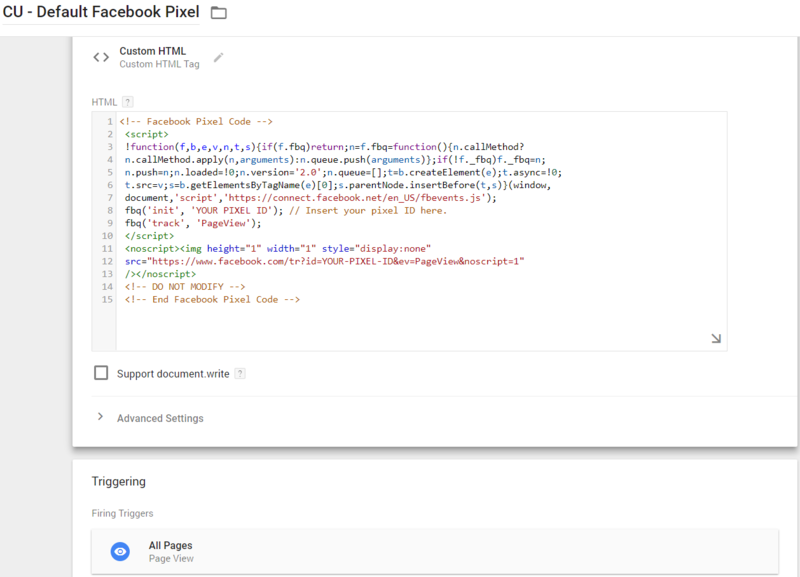 Using Google Tag Manager (GTM) to help implement Facebook pixels will help you consistently and easily track conversion and events from your website, allowing you to prove the success (or failure) of your advertising while building valuable data inside of Facebook that can be used for future targeting. 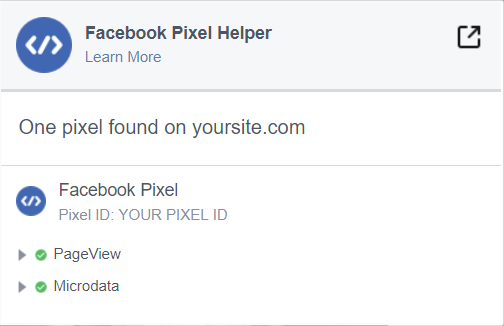 Conversion tracking: Facebook pixel ties conversions on your site back to specific Facebook advertising users clicked through. Optimization: After installation, you can set up automatic bidding to target people who are more likely to convert. Tying conversions back to your Facebook ads is not the only thing the Facebook Pixel can do. You can also track events – actions taken on your site – with the Facebook Pixel. To do this, you need to generate extra pixel code within Ads Manager. You can choose from a list of standard events Facebook provides for you, or create your own custom events that are based off URLs. For a complete description of Facebook Pixel events, check out this document written by Facebook. This sounds pretty great, right? Let’s talk a bit about why you should use the Facebook Pixel before we begin our walk-through of how to get the Facebook Pixel code, and how we can use GTM to implement it. Why Should You Use Facebook Pixel? Facebook is a major social media platform that can drive a great deal of traffic to your website. By using the Facebook Pixel, you will collect insightful data regarding actions and conversions that result from Facebook traffic. Google Analytics is great, and through audiences and remarketing, we can target people around the web. One of the great things about Facebook Pixel is that it can be implemented on your site in many different ways, especially with Google Tag Manager! Our first step is to generate our default Facebook Pixel in the Facebook Events Manager interface. A popup window will appear when you create your pixel. 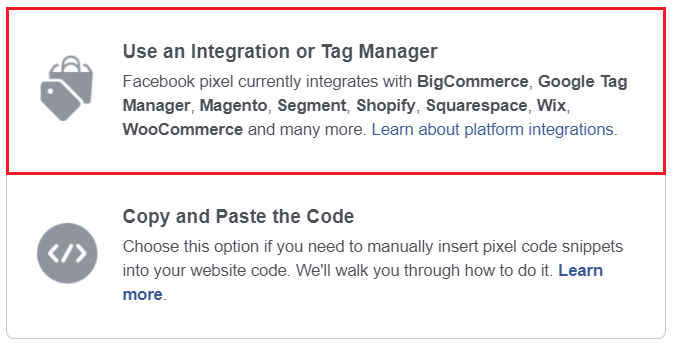 You will be given a few options for how to implement your Facebook Pixel, and we want to choose the first option: Use an integration of tag manager. Choose Google Tag Manager as your solution, and then you will be asked if you want to do a quick install, or manual install. You can choose to do a quick install, but for the purpose of this post, we will do a manual install. The next window will present us with instructions for implementing the base pixel code and any event code we wish to use. Copy the base code for use in GTM. Over in GTM, we will need to use a Custom HTML tag for our pixel code. Why are we using a Custom HTML tag you ask? Great question! While GTM has many built-in tags, there is not yet one for the Facebook Pixel! Therefore, we must resort to using the Custom HTML tag. In GTM, create a Custom HTML tag, and you guessed it, paste the pixel code into the tag. 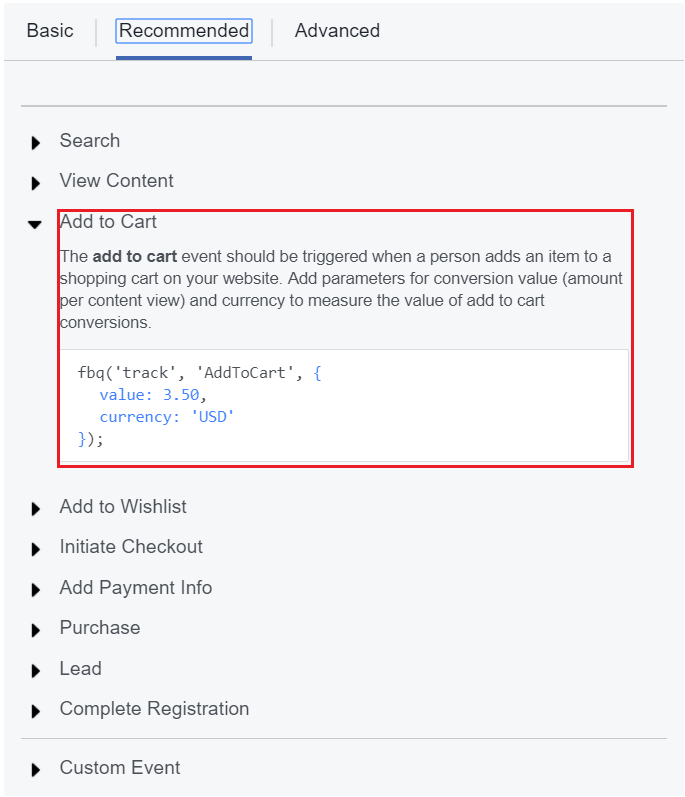 Let’s name the tag, CU – Facebook Pixel Event – Add To Cart, and provide it some extra parameters. *Note: you can use variables to dynamically pull in information regarding parameters like price, content_name, etc. as needed. Our default pixel tag and pixel event tag have been configured and saved, now we need to take them for a test run. To test out our two new tags, we can click the preview button in the top right corner of the GTM interface. We can now go to our website and check to be sure the CU – Default Facebook Pixel tag is firing every page, and that our add to cart buttons fire the CU – Facebook Pixel – Add To Cart tag. Once we see that our tags are firing, we can publish our container, and start collecting data. 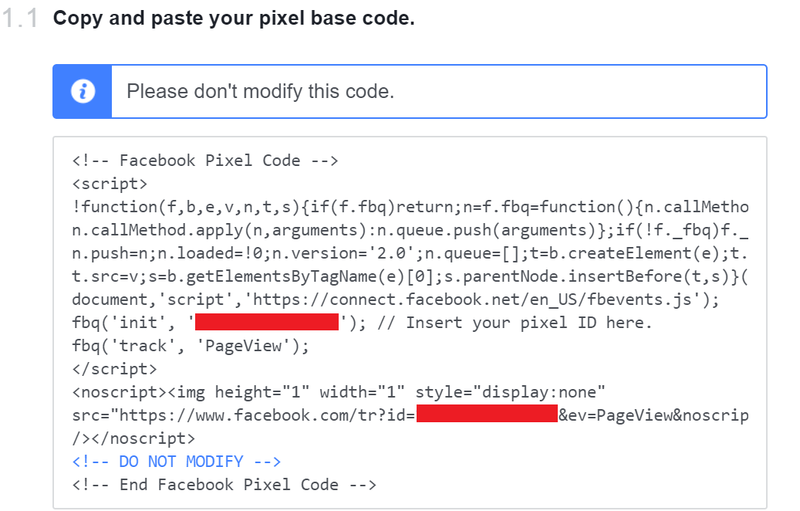 If you see your Facebook Pixel ID, and pageview data, then you know your Facebook Pixel is present on the current page. Navigate to a few others to make sure it is present everywhere. 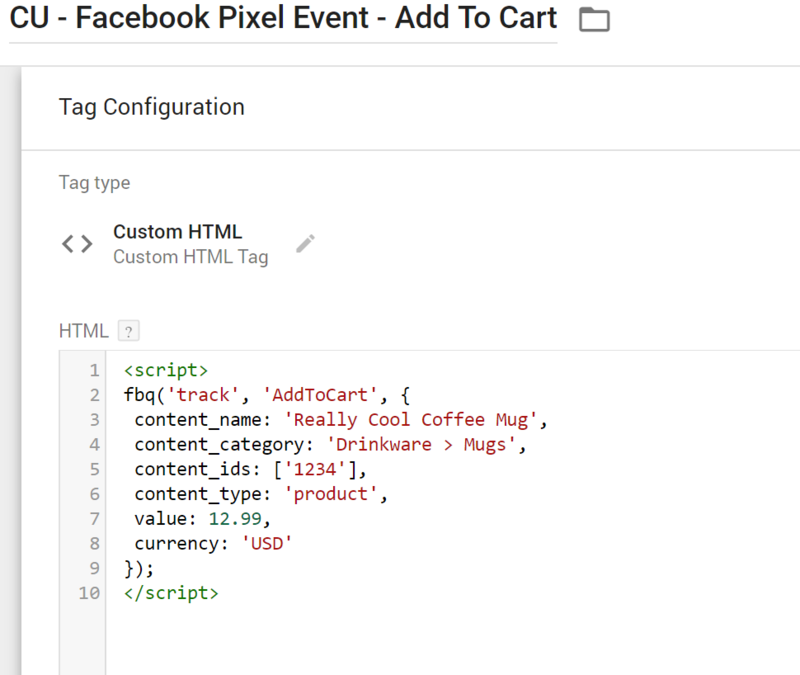 To test your add to cart event, you will need to add an item to your cart, and you should see your pixel event tag fire in the GTM Debug panel, as well as in the Facebook Pixel Helper extension. Facebook Pixel is an analytics tool that helps measure the effectiveness of your Facebook campaigns by what users do on your site. You will not see this data in Google Analytics, but rather in your Facebook Ads Manager account. Using Facebook Pixel gives you the opportunity to create custom audiences based on users who came from specific ads, set up automatic bidding to target those who are more likely to convert, and tie conversions back to your Facebook ads. Using GTM to implement your Facebook Pixel is an easy way to do this, and you can reuse triggers you have already created.